Starting and running your own business can be extremely rewarding, however, it is rarely a simple task. In addition to having a viable idea, recruiting clients, and obtaining supplies, business owners must also ensure they are in compliance with a number of federal and Missouri state laws. Since many small business owners may be largely unfamiliar with applicable business laws, it is always a good idea to schedule a free consultation with an experienced business lawyer at the Law Offices of Kenneth P. Carp at (636) 947-3600. We stay familiar with all applicable laws and requirements so that small business owners can spend their time focusing on what is important—operating and growing their business to achieve their goals. Small business owners must make countless decisions regarding the operations of their businesses. While some of these decisions may be relatively minor, others may significantly impact the chances of success or failure for the business. You should never risk making the wrong legal decision that may substantially impair your success. Your first major decision for your business will likely be which entity to choose. Small business owners have numerous options, including sole proprietorship, partnership, limited liability company (LLC), limited partnership (LP), and more. You choice of entity should depend on may factors such as tax benefits, corporate formalities, ongoing legal requirements, personal liability protections, and much more. An attorney can analyze your situation and advise you on the best entity for your type of small business. Legal matters and decisions will be ongoing during business ownership, as all small businesses must comply with a number of federal, state, and local laws. If you violate a law or regulations, you risk facing costly sanctions or penalties or even having your business shut down. A small business lawyer can help ensure you are constantly in full compliance with applicable laws. 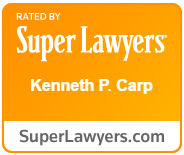 At the Law Offices of Kenneth P. Carp, we work diligently to help small businesses in St. Louis and St. Charles succeed. If you own a small business or are considering starting one, please call us today at (636) 947-3600 to schedule your free consultation.